There is a lot of work that goes into painting a car. However, with all of the television shows, such as, Overhaulin’, West Coast Customs, and Powerblock, it appears to be much easier than it really is. In this article, I will give you a few tips for painting a car that will make it easier for you, but it still requires effort on your part. Need a help in deciding what car paint protection Sydney you will use? A superb car paint services at Superiorshine.com.au I recommend as they use high quality of paint to preserve the resale value of your car. First, you must realize that this type of work is not for everyone. In fact, I have students that enroll into my auto body class that are surprised to learn the amount of effort it takes to properly repair and paint a car. Of course, I said to properly repair a car. I have watched several YouTube videos where someone is demonstrating how produce results using Rustoleum and a paint brush. Well, maybe that method will work for a farm truck or tractor….that is not going to cut it in the real world. It does take effort and time to do this correctly…more than 1 or 2 hours for sure. With that said, for the other gear heads out there, like me, the effort is not painful. If you love this type of work, the effort is fun and gets into your blood. So if this is not a hobby you enjoy doing, you may want to find something else that is. The first thing you want to keep in mind when painting a car is to clean the car. Over time, the car collects contamination from the environment and from waxing. These contaminates can cause a lot of problems for us in the refinish world. 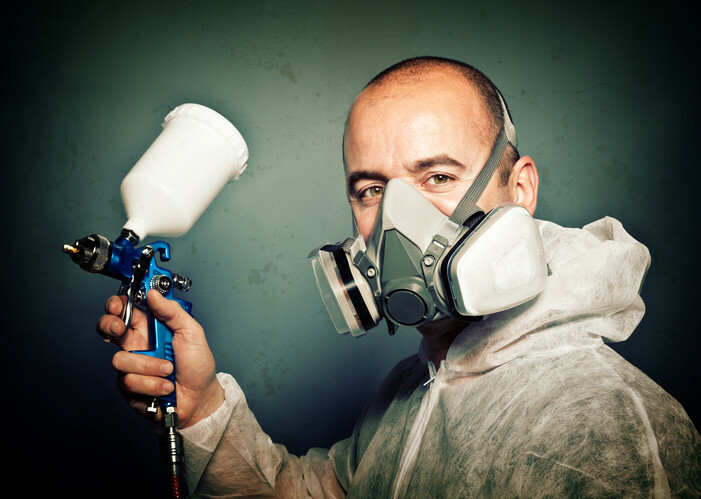 Contaminates such as silicone and oil is on the top of the painters bad list. To assure we eliminate this problem, an old fashion hand wash will do the trick. Remember, since wax and silicone are our enemy, don’t use a car soap with wax in it. We want to strip the wax, not protect and add to it. Dish soap will also work if it does not have added ingredients for keeping your hand soft. Once washed, wipe the car down with wax and grease remover to assure all traces of contamination are off the paint surface. If you are lucky you can sand and paint the painted surface. However, there are a few reason that will cause you additional work. If the surface is peeling, you will need to strip the paint off and start over. If it is just the clear coat peeling, you may get by with just sanding all of the clear coat off and starting the paint process from there. Another thing to keep in mind is how thick the paint is. If the coatings are over 12 mils thick, you will need to strip some of the coatings off so you do not keep building up the mil thickness. Ask the paint store where you buy your paint to check it for you. They should have a mil thickness gauge. If the car is a factory paint job, or if it does not have any paint problems, you are safe to prep and paint. To paint a car I am going to give you a wet sanding method, as you are probably a DIY car enthusiast without every tool under the sun. To do this all you need is some 400 grit wet or dry sandpaper, a squirt bottle with water and some genuine elbow action. Sand the entire surface you are painting with 400 grit sandpaper. Be certain to sand edges extremely well, as this is where paint will peel if not sanded properly. Once the entire car has been sanded, wash again to assure it is completely clean. Allow to air dry or use compressed air to speed up the process, and now you are ready for paint. If you did not do any body work and there is no bare metal, you do not have to use primer sealer. However, if there are spots where you sanded through leaving the car different colors, I would use a coat of primer sealer to get a uniform color before spraying base coat. If you can any bare metal, I would hit it with self etch primer in a rattle can before painting as well. Oh, and of course, don’t forget to mask before spraying! Now you are ready to spray base coat and clear coat. Each brand uses slight different methods and flash times. The best thing to do, is to ask for technical data sheets from the place you buy the paint. They will be able to provide these for you and it will tell you exactly how to spray their specific products. That is it, now it’s time to go out to the garage and get started painting a car yourself. I have been doing body and paint repair for over 20 years. The past 8 years I’ve been teaching this to students and now I am ready to teach you too. I hope you give me the opportunity to teach you more about auto body and paint repair. I will be delighted to teach you what I know to help you complete your car project or to gain the knowledge to know how.